While the overall scope of ReThink NYC’s RUN proposal is significantly broader than any individual proposal, each component of our plan is an improved version of an existing proposal that is currently moving forward in the New York Metropolitan Region. By breaking down our proposal into bite‐size chunks, we have made it feasible, while by coordinating projects we have significantly increased the benefit from every dollar spent. 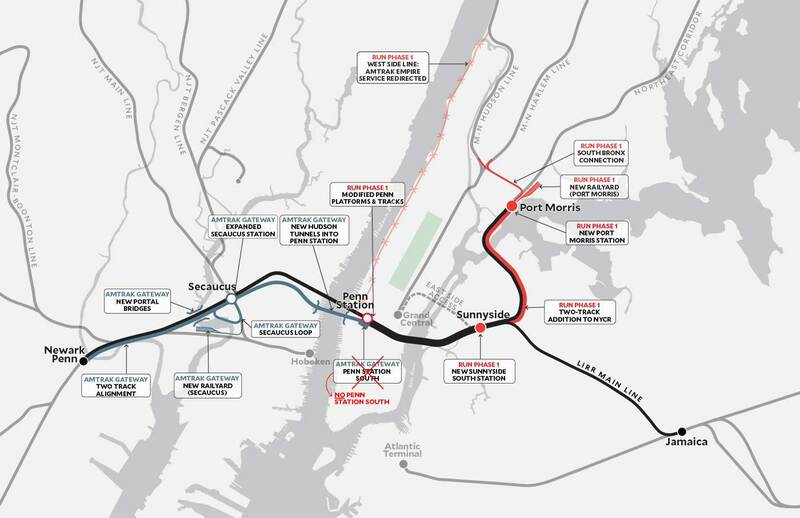 ReThinkNYC supports every component of Amtrak’s Gateway Program (in blue) with the exception of the proposed Penn Station South. 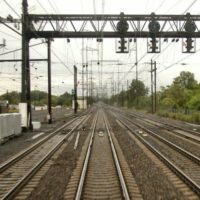 Amtrak’s Gateway Program will bring urgently needed upgrades to New York’s rail infrastructure. Its completion is of vital interest for the region, and all resources needed for its realization should be mobilized. 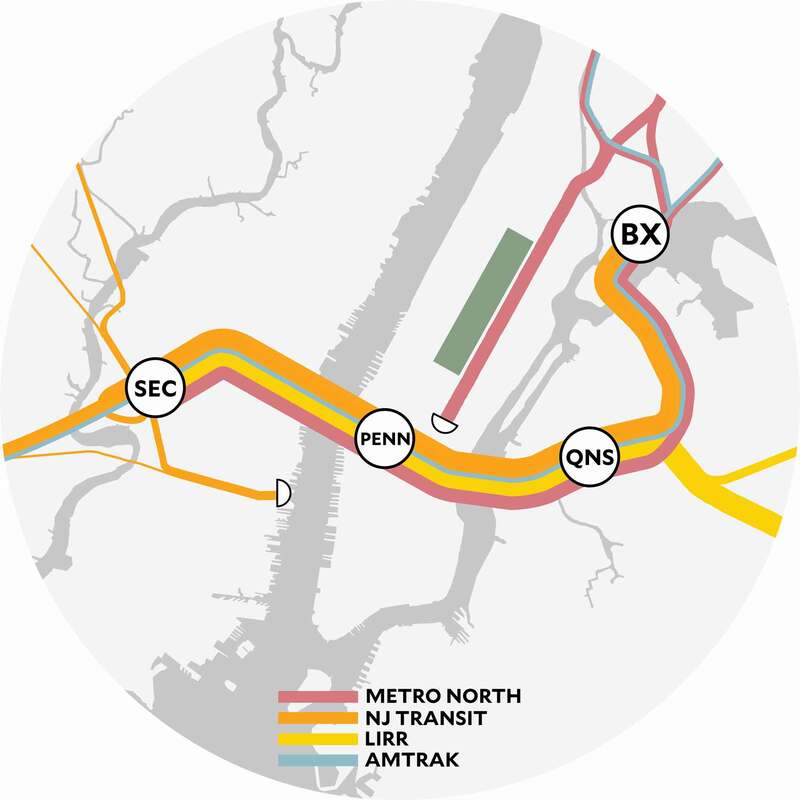 ReThinkNYC supports every component of Amtrak’s Gateway Program (shown in blue) with the exception of the proposed Penn Station South. 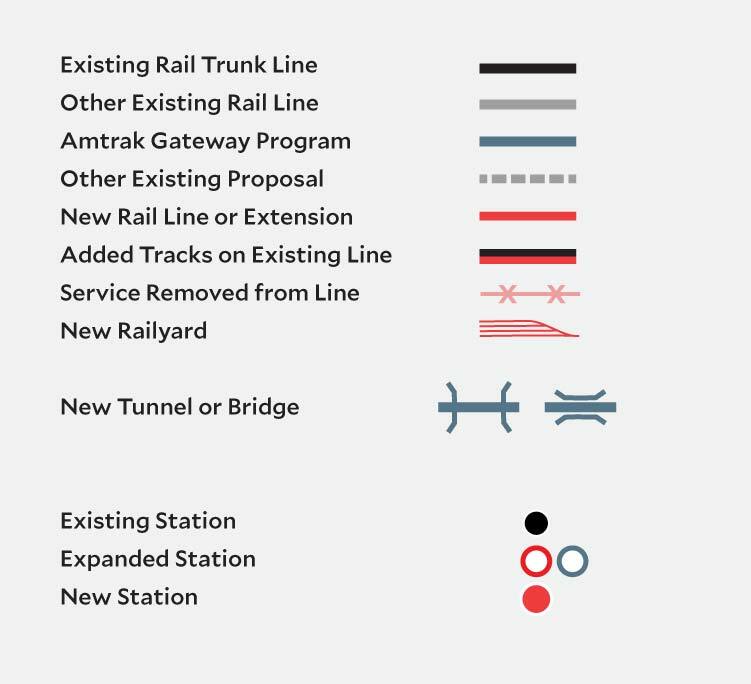 Phase One of RUN is a modified version of Amtrak’s Gateway Program, for the same overall budget. 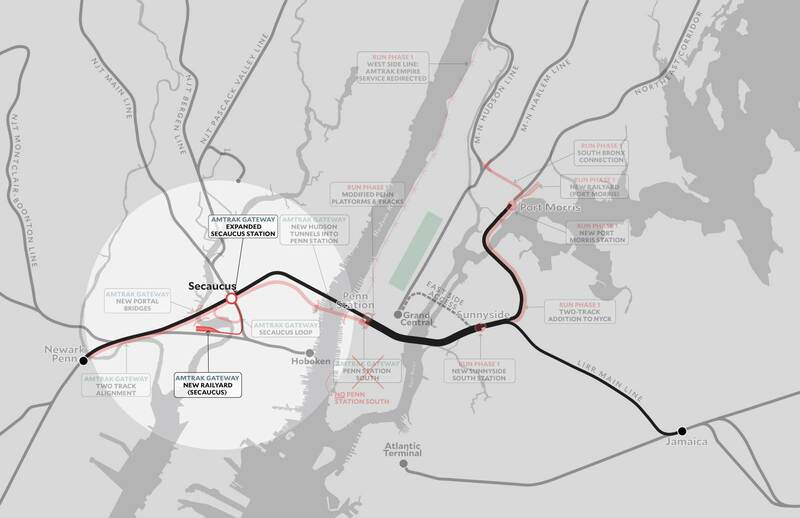 By doubling trans‐Hudson rail capacity, the Gateway Program has the potential to be transformational. Five of its six distinct elements, shown below, are crucial parts of RUN. Penn South is a planned new terminal station in Midtown Manhattan. It is cut completely from our plan. As envisioned in Gateway, Penn South is an entirely new expansion of “Penn Classic” by a block to the South. This would require the condemnation and demolition of a block‐and‐a‐half of Midtown Manhattan, including high‐rise buildings and a historic church. Its high costs do not justify its benefits. Penn South is necessary only because Penn Station is being operated as a terminal, but more than that, building Penn South ensures that Penn Station can only operate as a terminal for the foreseeable future; if the goal is eventually to have through‐running at Penn Station, then Penn South makes that harder. 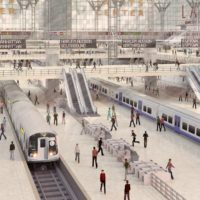 Trains would continue to get stuck in traffic jams, and passengers would still have to deal with a packed and unpleasant station. Adding hundreds of thousands of commuters to the already packed concourses at Penn Station is an additional recipe for chaos. 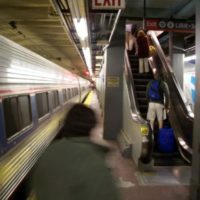 By investing instead on improving service at Penn, Penn Station South becomes unnecessary. RUN does this by implementing through‐running at Penn. It is more efficient than terminals and allows more trains to move through the station faster and with greater safety. • Bring every suburban line together on the same set of shared tracks. • Fix the problems afflicting Penn Station. 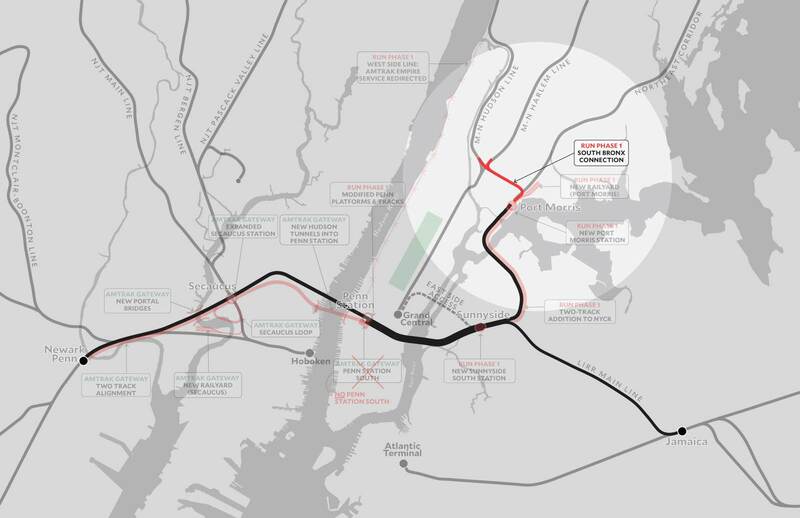 • Begin developing intermodal transit hubs outside of Manhattan. Fully four‐tracking the Northeast Corridor from Newark to New York Penn Station, including new North River Tunnels. Sufficient track and platform capacity, and vertical circulation, at Penn Station to accommodate 60 peak trains per hour – 30 per track – moving in both directions. This is the limit of modern signaling capacity, and because of the efficiency of through‐running is much higher than planned for in current proposals. It is a similar level of service to that provided on similar systems like the RER. 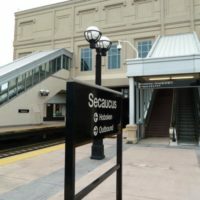 A station and yard at Secaucus sufficient to handle a significant number of terminating trains entering from the East and North. A station and yard in Port Morris sufficient to handle a significant number of terminating trains entering from the South and West. 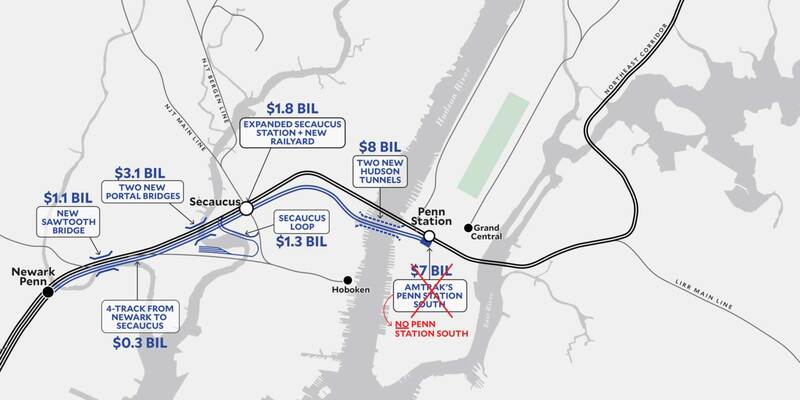 A loop at Secaucus to link trains from New Jersey Transit’s Pascack Valley, Bergen, and Main Lines to the Northeast Corridor. 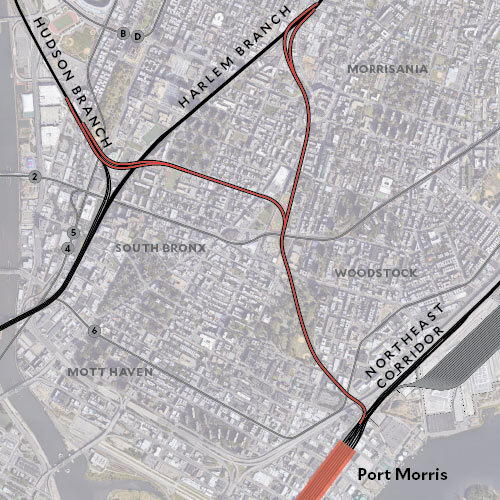 A connection in the South Bronx between the Northeast Corridor and the Harlem and Hudson Lines of Metro‐North. Sufficient “universal rolling stock” to allow reverse‐peak through‐running on all three systems. This can be met by modifying fleet expansion orders that all three systems will necessarily be placing over the next decade under any circumstances. 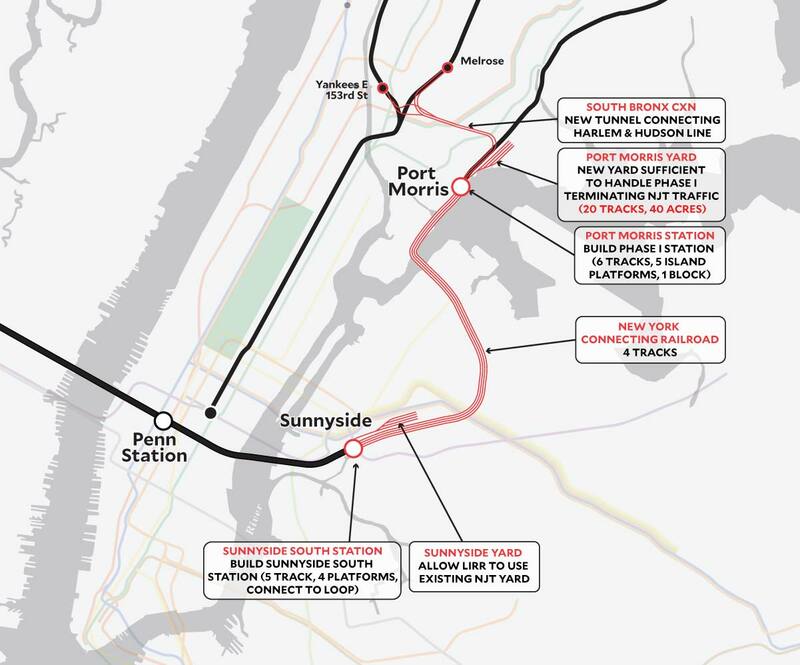 In Phase I, we begin the process of turning Port Morris and Sunnyside into major transportation hubs, and lay the groundwork for future growth. At Sunnyside, RUN would include a station between Queens Boulevard and Honeywell Street similar to one that was originally proposed as part of the East Side Access project for LIRR. This station would be able to connect to the Queens Boulevard Line and 7 Train subways. For the first time, the Long Island City business district would have direct access to the regional commuter rail network. The existing loop used by Amtrak would remain, and there would be a dedicated platform and tracks to allow Amtrak to service its fleet. 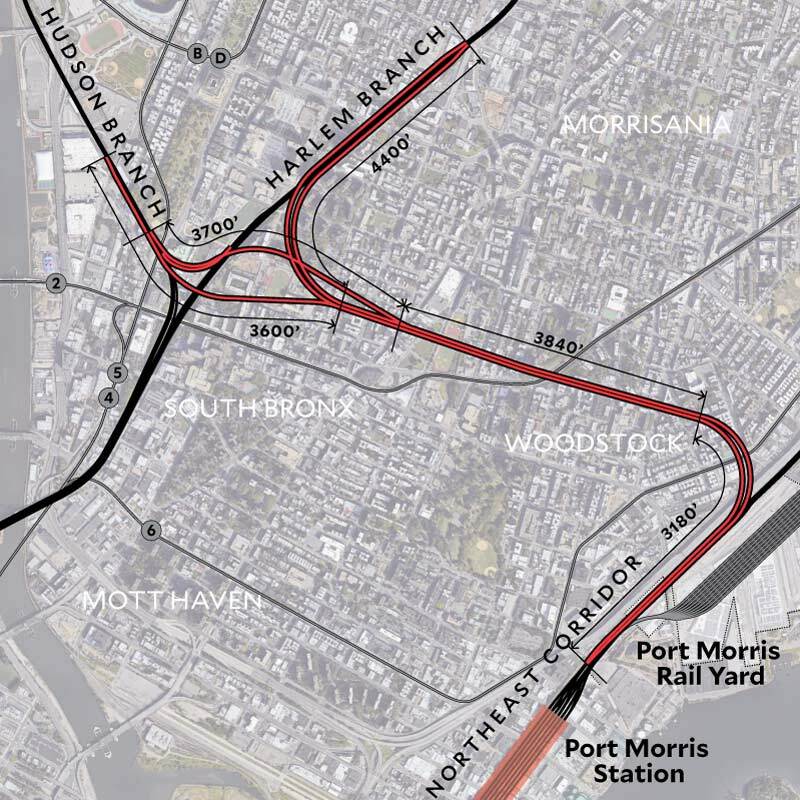 In Port Morris, the new station and yard would allow some New Jersey Transit trains to terminate, while others would be paired with Metro‐North to provide through‐running service. 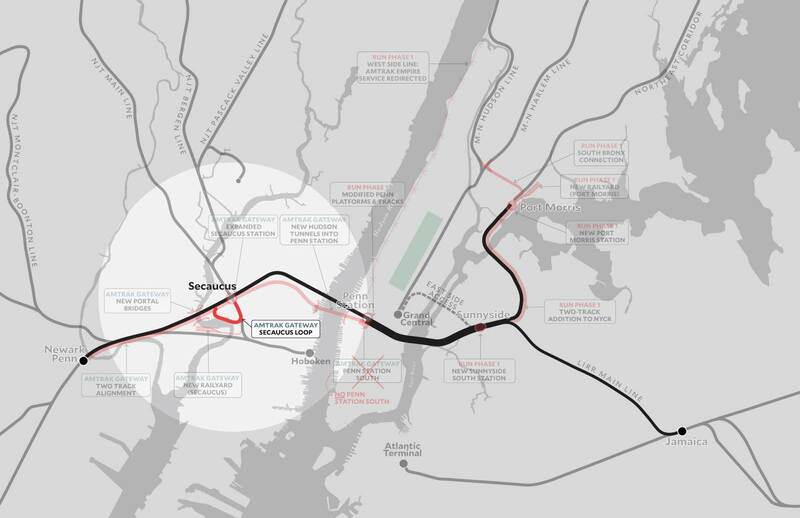 This new station would allow South Bronx residents frequent, easy access to both the suburbs and to Manhattan. The station would be designed to be able to easily expand to accommodate increased service planned for Phase II of RUN. 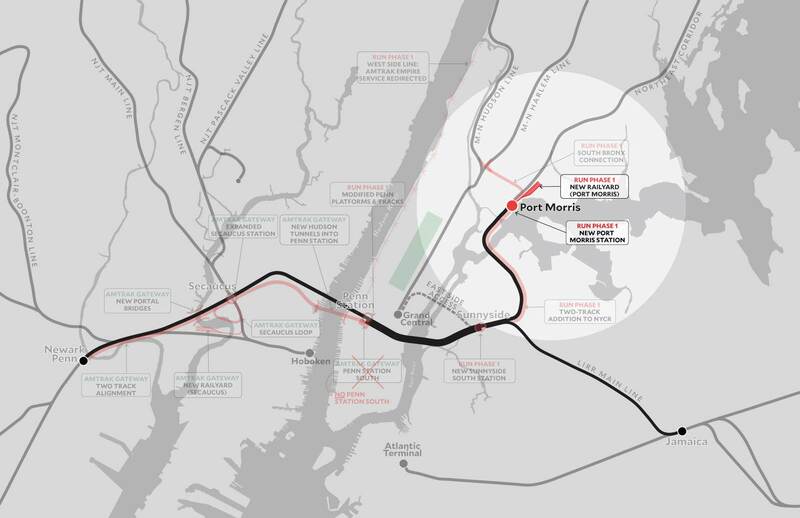 The South Bronx Connection links all three branches of Metro-North’s system to the Northeast Corridor. 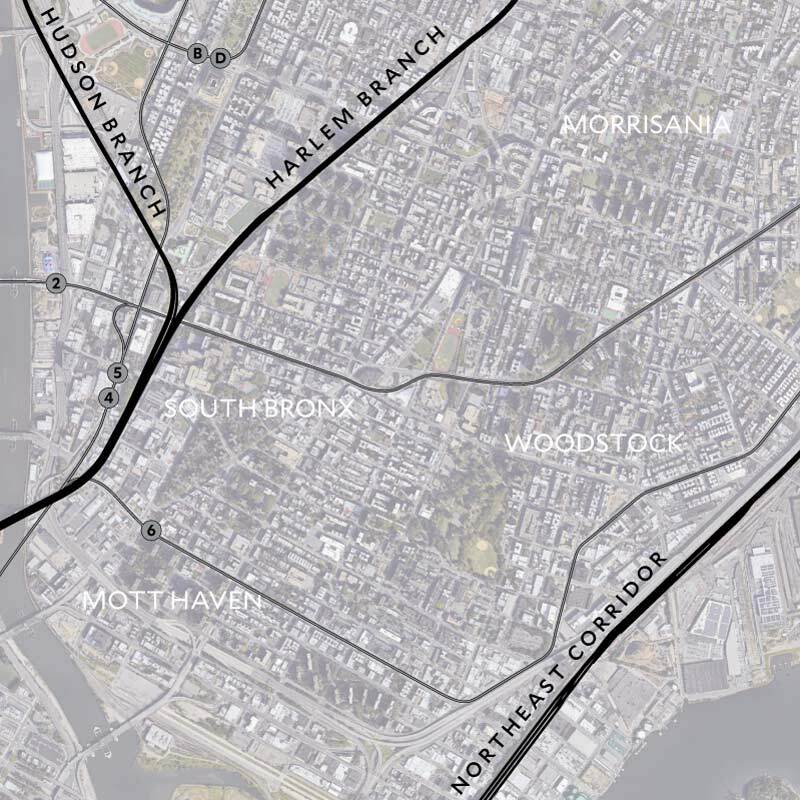 South Bronx is the last place where the merging of these lines can occur. New York has proven adept at building deep bore tunnels – as long as they don’t include deep‐bore stations. LIRR’s East Side Access tunnels to Grand Central were completed a decade ago, for instance, but delays in building the new LIRR terminal mean service wont start until 2023 at the earliest. 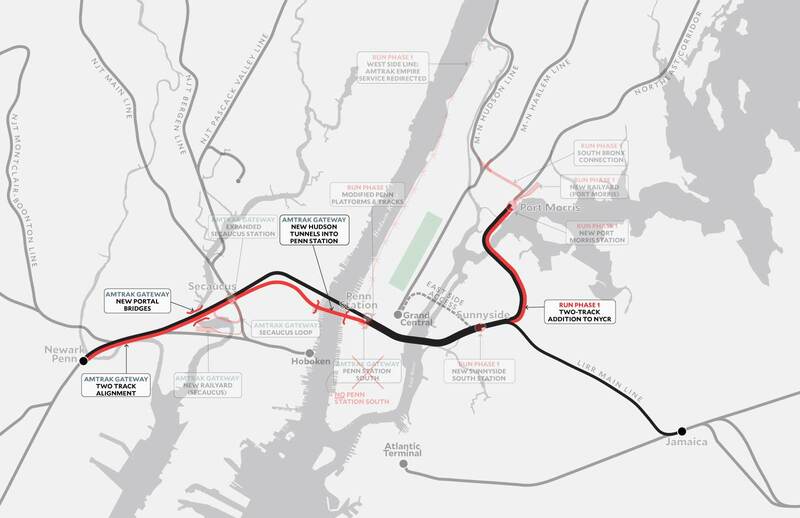 Our recommended option is for a new tunnel branching off the Northeast Corridor, running under 152nd Street, with branches connecting to the Harlem Line around Melrose and to the Hudson Line near Yankee Stadium. 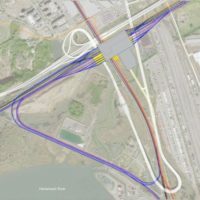 Alternatively, an abandoned right‐of‐way under St. Mary’s Park can be reused, though this would require a new viaduct on Randall’s Island. Either option is technically feasible, and policymakers can determine which is more cost‐effective. 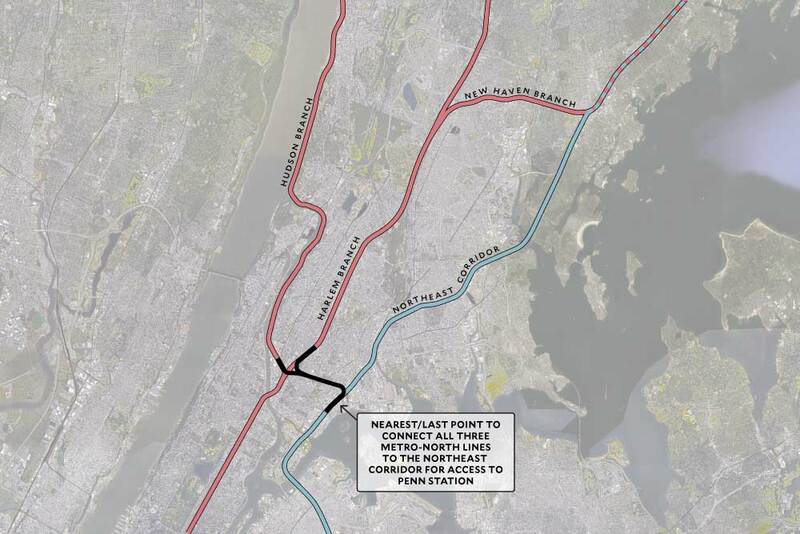 This would also be a faster route into Penn Station for Amtrak’s Empire Service. Existing conditions in South Bronx. 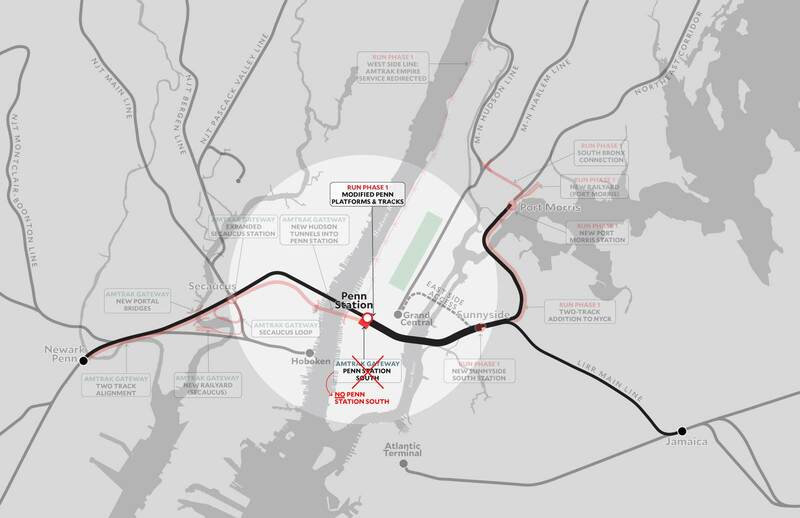 Map showing ReThinkNYC recommended tunnel alignment for the Bronx Harlem‐Hudson Connection. Map showing alternative option partially re‐using an existing right‐of‐way.  By redirecting the money that would be spent on Penn South we can build a connection that will bring every suburban transit branch in the region through Penn along a simple “trunkline.” In addition to providing new direct services, this trunkline will allow for easy transfers between trains serving every destination. 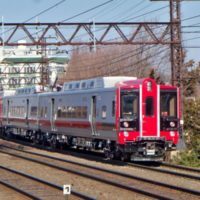 Transfers between Metro‐North, New Jersey Transit, and LIRR will work the same way that transfers between LIRR trains serving different destinations does at Jamaica today. It’s the same principle in use on the Subway when transferring from express to local service on the same line. 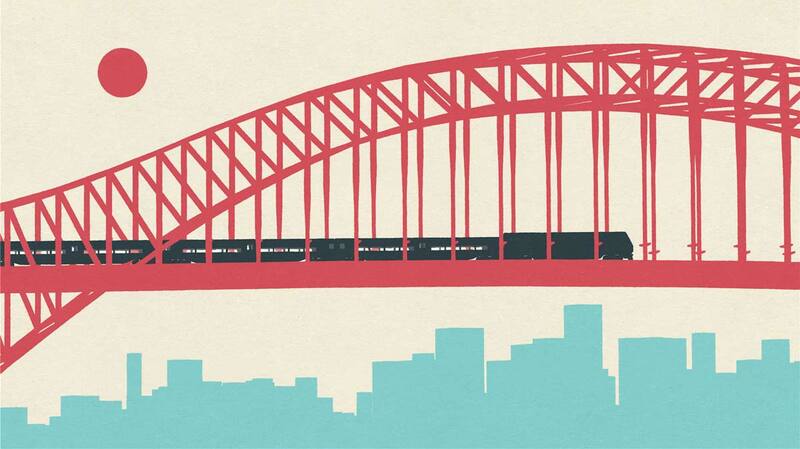 You’d simply walk across the platform, and quickly catch another train without precisely timing your trip.